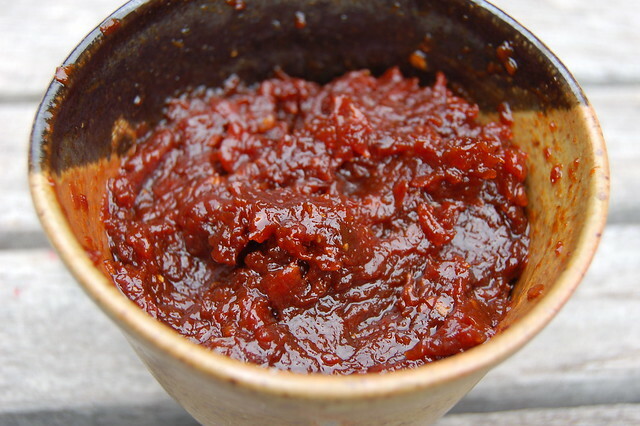 I first made tomato jam a few years ago as an accompaniment to a decadent middle eastern-inspired meal in honor of my friend Nadia and her then-boyfriend, Martin who'd made the long trek out from Boston to visit us in Berkeley. Nadia is an adventurous cook and an appreciative eater so we ended up spending a lot of our time together in the kitchen. In addition to the spiced tomato jam, the meal feast included spiced lamb kabobs, tzatziki (a.k.a., cucumber yogurt salad), lemon-scented quinoa with tahini and chickpeas, hummous topped with caramelized onions, Greek yogurt, roasted golden beets, pinenuts, and cilantro, and a green salad and some pita to round it all out. Needless to say, no one went hungry. 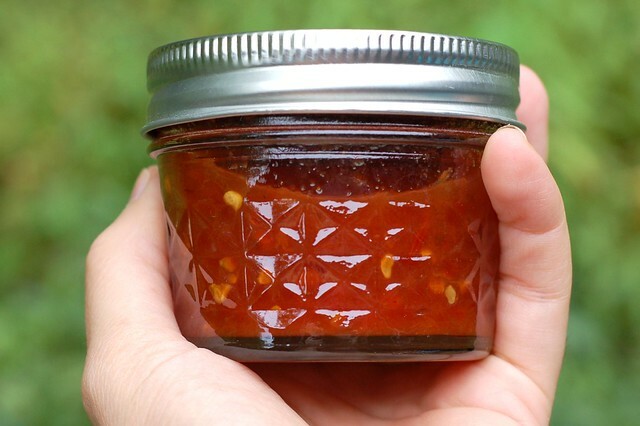 So when I saw this enticing recipe for tomato jam on Food In Jars (an awesome canning and preserving blog written by Marisa McClellan) I realized that it's been too long since I've made this delectable jam. In fact, not only have Nadia and Martin had time to tie the knot since I last made tomato jam, they now have an extremely cute 8-month-old, too. Looks like I've been slacking! Marisa's recipe below is nearly identical to the Mark Bittman recipe I first used. I don't think you could go wrong with either one but since I've already posted about the Bittman one, I'll give Food In Jars' version a try. 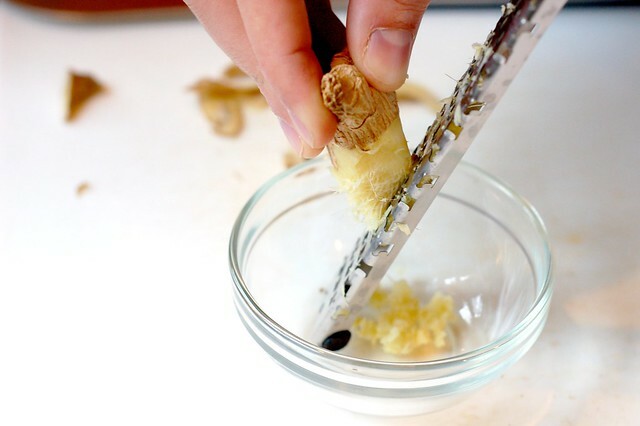 As canning projects go, this one is easy. Simmer it in a pot with lime juice, sugar, salt and a few ground spices until it gets thick and gooey. 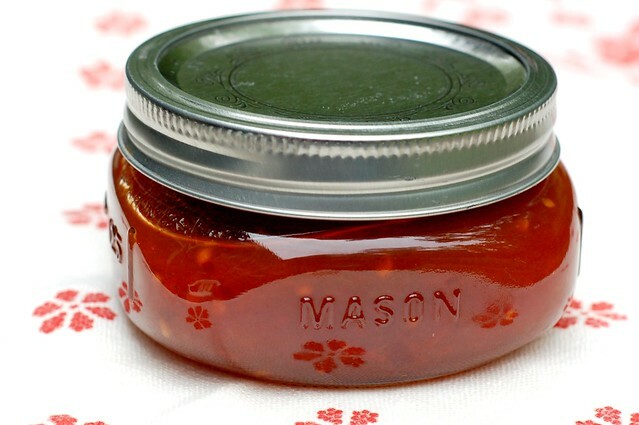 Fill your sterilized jars with the hot jam and toss them into the canning pot for a bit. Et voilá! 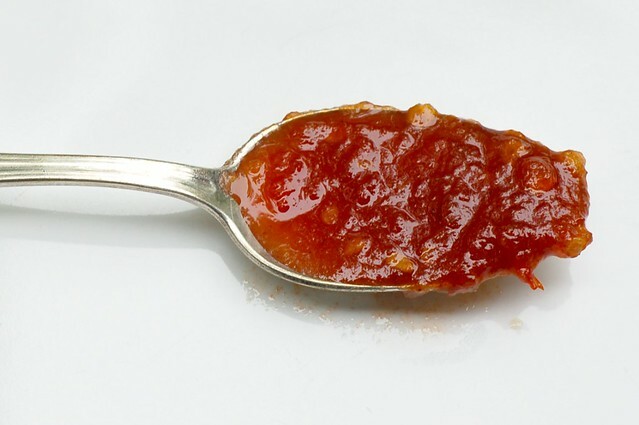 You have tomato jam - sweet, salty, spicy. Try this delectable jam on bread or crackers with some goat cheese or brie or something much stinkier, serve it with grilled sausage (it's great with these spiced lamb kabobs) or steak, use it in place of ketchup on a burger, or try it as a glaze for roasted chicken or pork - I think you will love it! 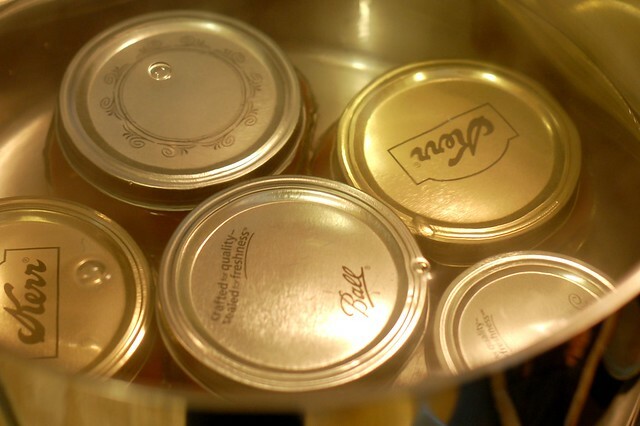 If you don't want to bother with canning, just cut the proportions down accordingly to make a much smaller amount. It will keep in the fridge for up to a week in a tightly covered jar. 1. Combine all the ingredients in a large, non-reactive pot. Bring to a boil and then reduce the temperature to a simmer. 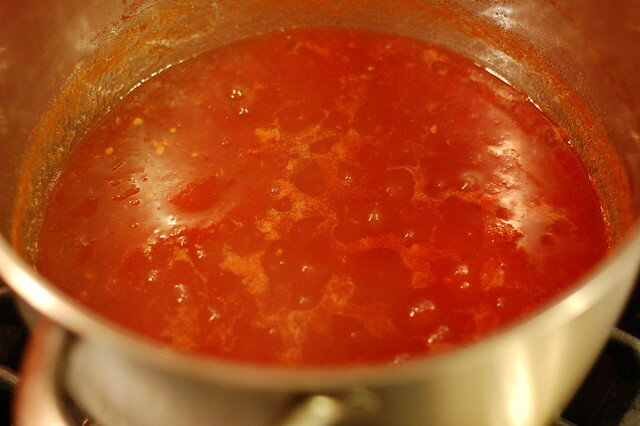 Stirring regularly, simmer the jam until it reduces to a sticky, jammy mess. This will take between 1 and 1 1/2 hours, depending on how high you keep your heat. 2. 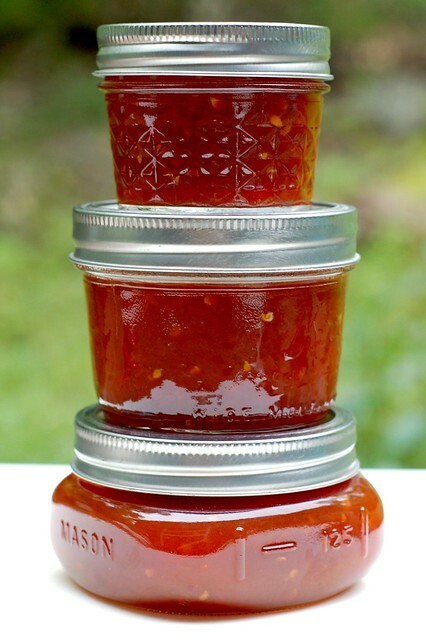 When the jam has cooked down sufficiently, remove it from the heat and fill the jars, leaving 1/4 inch of headspace. Wipe the rims with a clean, damp paper towel, apply the lids and twist on the rings. Process in a boiling water canner for 20 minutes. 3. When time is up, remove jars from water bath and allow them to cool. When the jars are cool enough to handle, test the seals. Store the jars in a cool, dark place for up to one year. Not feeling totally confident about how to can food? Check out my how-to post here for an overview of the process. I made this recipe on Saturday after a week of tomato canning (which included your heirloom tomato salsa recipe). I loved the way the jam turned out! This looks like something I'd like to try! This looked so good that I picked up some tomatoes today to add to our home grown ones, and have a pot simmering on the stove now! Can't wait to try it. 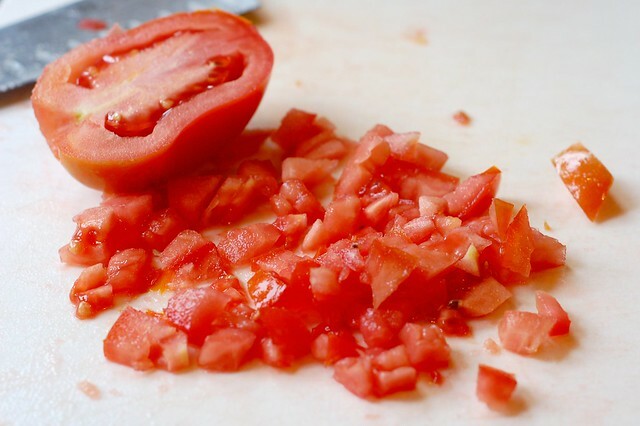 I've got a load of tomatoes that have this recipe's name on 'em. Thanks. Can't wait to taste it. I made one batch....then another, and another, it's wonderful! Everyone that's tasted it, loves it! Thanks for sharing! I made this for a greek inspired menu for a wedding of 150. When the bride and groom to be did a tasting, they said I could skip the tomato jam. However, when they tasted it (served with Keftedakia--greek meatballs) all they could talk about was this jam. It works perfectly with all different kinds of meats. I now use it on hamburgers instead of ketchup. I have even made parmesan crisps and served them with a dollop of the jam on top. Great flavor and spiciness without being hot. I would highly recommend you try this recipe. Wow, Pam, that must've been a lot of tomato jam! So glad that you and they liked it and you've introduced many more people to this wonderful jam. So you don't peel the tomatoes first? Made the tomato jam but did not water boil after putting it in the jars. Anyone know the shelf life in fridge? Is freezing tomato jam an option? After cooking jam I put it in jars. Did not water boil jars. Anyone know what shelf life might be? Is freezing an option? Don, you can try freezing it. Definitely keep in the fridge - I don't know exactly what the fridge shelf life would be but just sniff and make sure it's not moldy before eating. Hey Eve! 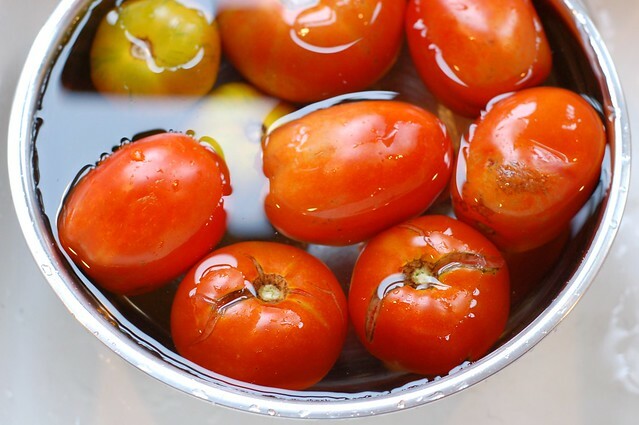 Last Sunday I have made tomato jam by following your given steps. You know? it was made very tasty and delicious. I just put it into the big jar. Can I freeze it or not? I am waiting for response. Thank you so much. so glad it turned out well! Yes, I'm sure you can freeze it. I am going to make this recipe in evening, because I cannot stop myself after looking this recipe on your website. Thanks for sharing. Let me know how it turns out! Hope you like it. Hi, did you really process half pint jars for 20 minutes? Hello there! Love this recipe! Can be a chutney or it taste more like a jam? And the seeds looks strange for me, does it tastes good? Thks!